[In this particular front page copy of the Aida Parker newsletter that I got off the internet, you can actually read some of it. In here you find the "saintly” black Bishop Tutu saying many things. But notice here that Aida Parker got this from her many sources across the world. 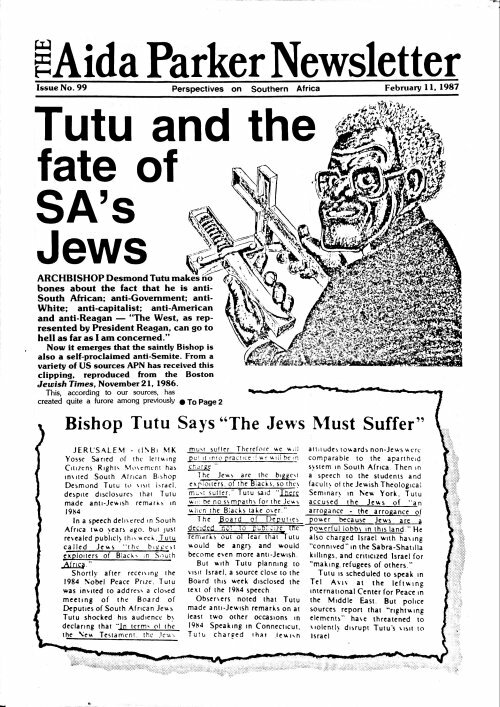 The implication is that Tutu is an anti-semite. I’m sure that Aida Parker, in line with common Afrikaner conservative thinking back then, just like modern American “conservative thinking” always defended the Jews. I NEVER remember any whites in South Africa ever saying something negative about the Jews because the Jews were considered “white” and they were welcomed among us. When I look at this headline and read it, I see nothing to indicate anything except SUPPORT FOR THE JEWS as was the norm in South Africa all the time and even now.